Rare and Collectible 17th Century Antique Caucasian Kuba Blossom Carpet, Country of Origin / Rug Type: Caucasian Rugs, Circa Date: Late 17th Century – True to many exquisite Caucasian rug designs, this breathtaking antique Kuba Blossom carpet features numerous angular motifs that inspire serene sensations. Their minuscule size is perfectly offset by their variety of colors, resulting in a graceful combination of style and detail. The largest frame features the most activity, and smaller borders lead to and from the larger one, themselves showcasing attractive spires that extend outward to the edges of this 17th century carpet. 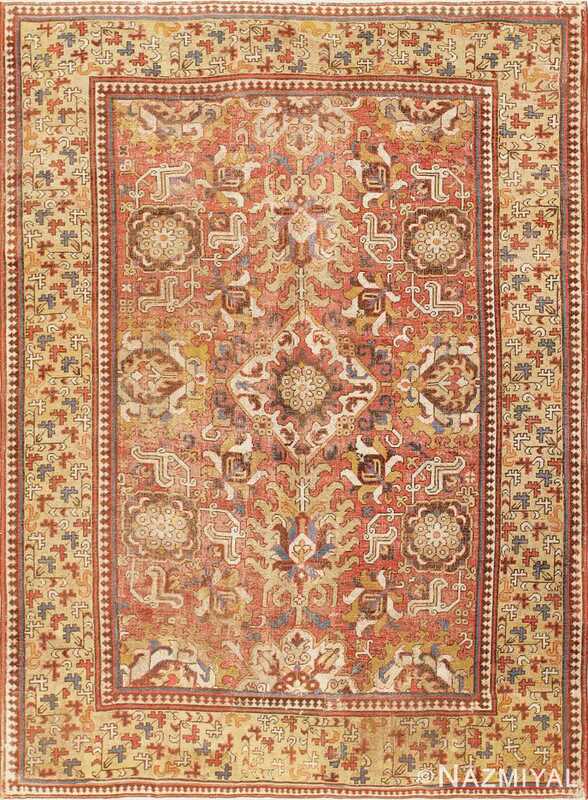 At the antique rug’s core is a rich red field that houses a multitude of petals and flowers. These are similar in design and presence to the ones established in the largest border, though the ones at the center are also set beside larger mandalas and blossoms. The differences in height and size break up the otherwise even spacing and sizing, resulting in a vivacious display of activity similar to what one might find in the natural world. Aside from its beautiful time softened colors and classic design, one thing that stands out about this breathtaking 17th century antique Caucasian Kuba Blossom carpet is how well preserved it is for its age. This antique tribal design Caucasian rug was woven in the 17th century in Kuba, a city that is located in the Caucasus mountain region. The exquisite design of this antique Caucasian carpet highlights the concepts of symmetry and contrast. The central medallion design of the Caucasian Kuba rug provides a point of balance in the design, which complements the geometric arrangement of the smaller floral motifs in the main border of the antique Kuba Blossom rug. The large scale of the flowers in the field of the rug contrasts with the delicacy of those used in the borders. In addition, the flowers in the field of the rug use curves as a point of contrast to the angular representations of the small flowers in the border design. The border of the rug is wide and is not subjugated by the bolder designs used in the center of the antique Caucasian tribal Kuba rug. It holds its own weight as a design element. The artist who designed this magnificent antique rug utilized contrasting background colors in the main border and field of the rug, yet connects them through picking up these colors throughout the design and distributing them throughout. The design of this rare and highly collectible rug is colorful, balanced,and represents the tastes and stylistic conventions of 17th century. This is an important piece both artistically and historically. Without a doubt, this great 17th century antique Caucasian Kuba blossom carpet would make an excellent addition to any home design, office interior, or for the serious antique rug collector who wants a beautiful early rug of historical significance.